Northglenn, Colorado is located a mere 15 minutes away from Denver, 25 minutes away from Denver International Airport, and 30 minutes away from the majestic Rockies. If you are looking for a perfect centralized location to all that Colorado has to offer, Northglenn is the place. Residents have access to convenient shopping centers, parks, lakes, and enjoy small neighborhoods with schools nearby. In May 2016 Northglenn was named a Tree City for the 26th time. Northglenn residents may obtain a permit to house chickens and/or bees in the backyards of their homes. There are over 20 different events each year in the city! When it comes to trash and recycling, Northglenn is one of a few cities that provide many different options when it comes to getting rid of your waste. For example, the city provides 2 free “Special Pick-Ups” to residents for items that are too large for the normal trash can. For more information on this, please check out Northglenn’s site. Additionally, two times a year the city also has “Free Landfill Day“, where people can throw big items into a nearby landfill. The city has also recently implemented a recycling program in which recyclables are picked up curb-side every other week in an effort to make the city greener and cleaner. So what happens when you are doing a home renovation project, working on a construction site, or needing to get rid of items that will not fit in a trash? If you have already maxed out your special pick-ups OR are not working around the free landfill day, a dumpster rental is the perfect option for you! A roll-off dumpster allows you to get rid of almost all types of materials, trash, certain appliances and much more at a low cost. When a dumpster is placed near your house, office, or construction site, getting rid of unwanted waste is easy and convenient! 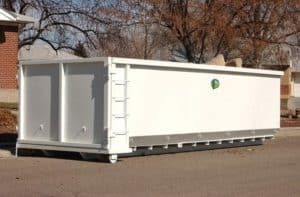 Affordable Roll-Offs is your locally owned, Denver-based dumpster rental company that is here for all of your dumpster rental needs. It does not matter if you have a project that requires one small dumpster or 100 large ones, we are here for you! Please call us today for more information!